The rally that powered stocks to record January gains went flat last week, but for a bullish reason: sustainability. 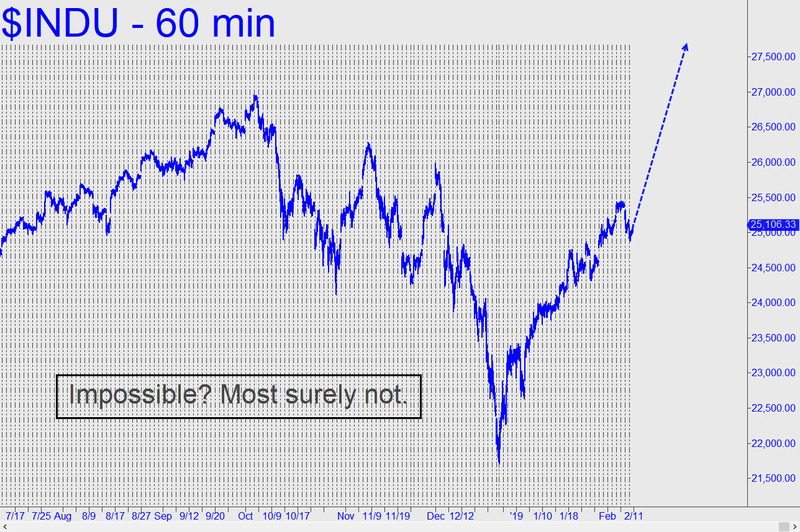 DaBoyz are in no rush to foster the illusion that new record highs are possible. Accordingly, they have adopted a go-slow approach that the news media and investors can literally buy into. Keep in mind that if the Masters of the Universe are very successful in keeping this deception alive — a big “if” at the moment — a stock market with no shortage of good reasons to fall could instead ascend to new highs. This will always be possible, since it is not the health of the economy that drives the markets, but the other way around. For it is purely cyclical forces cause stocks to rise and fall, often mysteriously. When shares are rising — manifestly for no good reason — this energizes and lubricates the gears that make the economy hum. The effect is mainly psychological; it is a change in attitude and perceptions caused by rising stocks that brings the economy back to life. If you want a closer look atRick’s Picks,click hereto sign up at the top of the home page for a free two-week trial subscription -- no credit card needed. Drop by the 24/7 chat room first — and be sure to say hello when you arrive!